HoneyComb is a new range of snap together electronics components that can be used in maker and STEAM education and by beginners and hobbyists who want to explore making with technology. 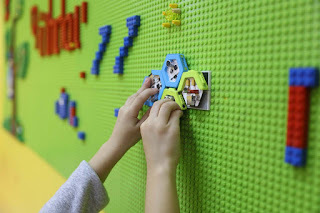 The HoneyComb range includes lots of modular electronics components than can be physically and electronically joined together using magnetic connectors. The hexagonal design enables components to be connected in interesting ways. The backs of the modules are also magnetic so you can mount them on a metal fridge, cabinet or notice board which is neat. HoneyComb have demonstrated integration with some cool technologies such as the LEAP motion controller and a mind control headset, and they've prototyped lots of different modules. Music Kit - attach conductive objects and create electronic music. Sound effects can be selected by entering binary codes using dip switches. You'll also be able to play MP3 audio files. Camera Kit - includes a camera module take photos when a trigger is activated. Photos can be stored to an SD card. IoT Kit - supports app control and browser-based Blockly coding to create connected projects. Communication with HoneyComb is via wifi. HoneyComb is designed to be suitable for children aged 5 right through to older makers. Yes, it will be LEGO compatible. HoneyComb only mention 9V battery power at the moment which looks like a limitation for making practical gadgets. There's no mention of whether rechargeable batteries can be used. You can find out more on the HoneyComb Kickstarter campaign page.